I interrupt my pop culture blogging with this announcement: San Diego Zoo’s panda cub Xiao Liwu turns one today. HAPPY BIRTHDAY WU WU!!! Pandalovers’ favorite panda cubbie is now a toddler; a year in a panda’s life is equal to four human years. More panda facts here. Wuwu is the sixth cub of panda mama Bai Yun and the fifth of his dad Gao Gao. His name Xiao Liwu means “little gift”; SDZ had a poll on what name to choose for the cub and I voted for this name so I feel more connected to him! 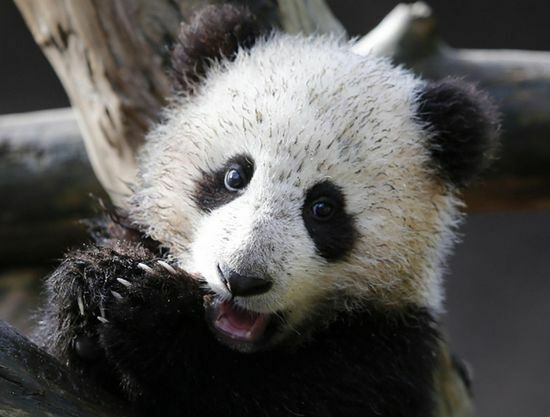 Wuwu lives in San Diego Zoo with his parents and elder brother Yun Zi, but when he turns four (or 16 years old in panda years), he is expected to return to China. His turning a year old means I have been watching him for a year now too. He’s my first cubbie, as many panda fans would refer to the first cub they have watched grow up, mostly through the panda cameras such as the one in SDZ. When stress would become unbearable at the office, I would switch to the panda cam for some pandatherapy. I’ve seen when Wuwu was just a small ball with barely no fur, eyes barely open, up to now when he’s becoming such a pawful for his mother. Wuwu loves to climb trees. Maybe he wants to be part of Cirque du Soleil when he grows up. But there was a time that he would often fall from the platform where his mother loved to lie down, and anyone who would be watching the pandacam that moment would gasp and stop breathing, worried that the cubbie has broken his bones or worse, died. 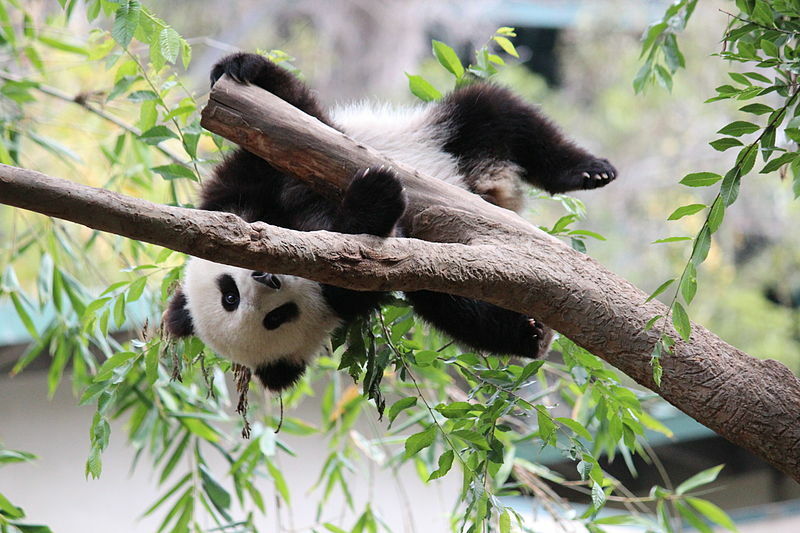 But Wuwu, like any other panda, is born to bounce off their fall as much as they’re born to climb trees and just be adorable without even trying. It must be exhausting and a lot of hard work to be this cute. This is one of my favorite videos of Wuwu, when the SDZ staff could still bring him in for his weekly check-ups and measurements. Now, it would be impossible because he already has a mind of his own. If I’d have a second career, I’d love to be a panda keeper. And it’s my dream to be able to hug a panda for real and not just watch them through an enclosure (like I did in Ueno and Chiang Mai zoos). Aside from Arashi, pandas are among my therapy in life. Watching them is calming. It must be in the yin and yang that they symbolize. Oh Wuwu, don’t grow up so fast. Let’s have some boo tea. That’s colored GREEN, right?